I’ve been to Chile several times before, so my focus on this particular trip has been volunteering, not exploring. But I couldn’t spend two months in any country without taking a little time to see new (or favorite) places. So, after 7 weeks of volunteering on Isla Tenglo, I bid farewell to my host family, my neighbors, and my new friends, and I boarded a bus headed north. I would stop at Concepcion and Chillan before heading to Santiago for my flight home. The first leg was Puerto Montt to Concepcion. I booked a $38 ticket for a premium cama (fully reclining) seat for the 8-hour trip. Ironically, I actually didn’t sleep much, but rather just thoughtfully peered out the window enjoying the view of countryside and volcanos. About midway, I noticed dark smoke (not clouds) billowing above the mountains on the horizon. My first thought was a volcano had erupted. But as we got closer, I could see it was a wildfire spreading through the dry farmland, with fire trucks and crews racing to control the blaze. They diverted our bus to a detour route, once which would end up increasing our travel time by 2 hours. Finally in Concepcion, I took a cab to my Hotel Alborada. The hotel had received good reviews online. My experience, though, was a bit disappointing. After an extended bus trip, I just wanted a long, hot shower. No luck; no hot water. The disappointment was partially offset by the breakfast buffet and central location. The next day, I took a walk along the river front (Concepcion is located along the Biobio River) which has a bike path and a few small parks and memorials. Then I headed toward the main plaza, weaving my way through the bustling streets. For dinner, I spoiled myself and grabbed a table at Quijote, one of the best restaurants in town, located right on the Plaza de Independencia. I ordered a huge steak, mashed potatoes, tomato and avocado salad, and two glasses of wine for $40 USD. Not bad. After dinner, I wandered down to Plaza Peru where there were quite a few cafés and bar with both indoor and outdoor seating. I enjoyed my first official “michelada” (lager with lime juice and salted rim) before heading back to the hotel. If I'd been traveling with friends, this might have been a cool spot to spend the evening out and about. In the morning, after another breakfast buffet, I took a taxi back to the bus station for the next leg of my trip – a 2-hour bus ride to Chillan. I had visited Chillan back in 2008, and had fond memories of it. Arriving at the bus station in Chillan, just off Avenida Ecuador, I walked a few blocks back down Avenida O’Higgins to my hotel, Hotel Diego de Almargo. (Conveniently, the bus had passed by the hotel on the way to the station, so I was able to spot it and navigate my way back on foot.) The 10-story hotel appeared to be newly built, and offered modern amenities like a pool, sauna, and gym. More importantly, though, the hotel had lots of hot water, and was easy walking distance to the bus station, the train station, and the main plaza. After checking in, I headed out to the Plaza de Armas. I was surprised to see the quaint, shady park covered in tents and kiosks. As it turned out, there was a National Folklore and Craft Beer festival going on this weekend! So much for eating healthy and getting rest. I sat in the park and nibbled on kebabs, choripan, and beer, watching people and listening to music. I walked through the shopping district and central market as well, but was quickly drawn back to the park. In the morning, I enjoyed an even better breakfast buffet. Satiated, I laced up my boots and walked around town, perusing the stalls and mini-restaurants in the “mercado.” I ended up in the park again, washing down a choripan with a fruit smoothie and hoping they cancel each other out. I remember in 2008, I had walked all the way down Avenida O’Higgins to Chillan Viejo. I didn’t do that this time, but I remember it being a nice walk and a good way to spend the afternoon. Something for next time. I stopped by the train station in hopes of buying my ticket to Santiago for tomorrow morning, but the station was closed. I headed back to the park for the evening and for more healthy eating of grilled meats and French fries. I noticed a taxi loitering outside, so I hopped in and asked him to take me to the main bus terminal, where I would book a bus to Santiago. I found one operated by EME that was leaving momentarily, with semi-cama seats available for $20 USD. Great! I loaded my bag and hopped on – buying my ticket once we were moving. I was in the far back corner, a window, which seemed like a good spot to be (other than having to awkwardly crawl over the man in the aisle seat). Once I was in, great, footrest and recline….until the man in front of me reclined his seat almost onto my lap! Ugh, I could barely raise my knees and felt very claustrophobic, especially when the air conditioning seemed to only work every 30 minutes or so. I focused on watching the landscape and surfing the web – yes, the bus had WIFI thankfully (though no power supply). I arrived in Santiago at 1:30pm, and again took a cab to my hotel. I checked into the Hotel Sommelier Boutique, on Avenida Merced, and was pleasantly surprised. The hotel was very nice, quaint, and definitely boutique. It was centrally-located in Belle Arts, with a grocery store across the street. After settling in to my room on the “Sauvignon Blanc” floor, I took a walk to Plaza de Armas, through the mural-lined Barrio Bellevista to the café/bar lined of Avenida Pio Nono. I enjoyed a curbside beer and “Thai Pollo” at a restaurant along the popular street. Then I went back to the hotel and decided to just lounge in my room to watch the Super Bowl. I ordered a salmon and avocado salad to go from a restaurant around the corner, but had difficulty eating it without a fork and difficulty tasting it without dressing (which I’d forgotten at the restaurant). The next morning, I enjoyed yet another breakfast buffet. The buffet at this boutique hotel was a bit fancier than I need, offering gourmet pastries and dessert items. I stuck to cereal, eggs, juices, and coffee. I spent the day and evening poking along the streets of Lastarria, Belle Arts, and Bellevista again, just enjoying my time in this large, international city. I returned to the hotel early to pack my bags. Tomorrow I return to the U.S.
On the morning of February 6th, I enjoyed my final breakfast buffet (and late checkout). After a second coffee at the rooftop café in the hotel (which I forgot to mention is a cool feature), I ventured out for a final meal – I chose the “menu del dia” at the Utopia Restaurante on Lastarria. It was good food at reasonable prices, good WIFI, and good street-scene (passers-by, vendors, etc.). At 5:00pm, I went back to the hotel to watch the launch of the SpaceX Falcon Heavy, grabbed my backpack, and headed to the airport for my own take-off. Although I wasn't headed to outer space, I did have second thoughts for a minute as we descended over the $5 billion donut-shaped, space-age headquarters in Cupertino, California. The week of exploring was just what I needed. It was actually less about exploring, and more about just resting and reflecting on my time in Chile. And what a good time it was. All 8 weeks of it. Thanks to everyone who was involved in hosting me, entertaining me, and helping me on Isla Tenglo. I’ll miss you, but I know I’ll be back! I'll miss waking up to this view on Isla Tenglo. Bus trip to Concepcion was extended by 2 hours, as we detoured around a wildfire. The crews fought vigorously to control the fire. Fire endangered this small town. Having made it to Concepcion, I walk along the boardwalk and enjoyed the view of Biobio River. Coincidentally, there was a folklore and craft beer festival on the same weekend as my visit to Chillan. The mini-restaurants in the 'mercado' in Chillan. A staple food in Chillan - a choripan with all the trimmings. Live performances of music and dance at the National Folklore Festival in Chillan. 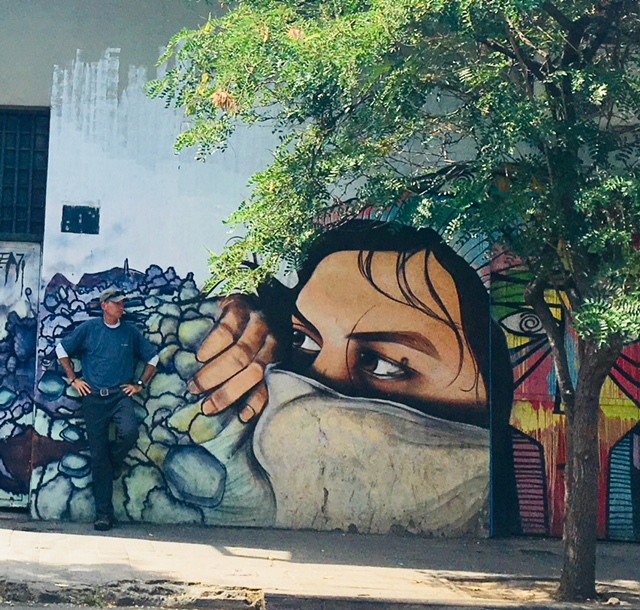 Admiring the mural-lined streets of Barrio Bellevista in Santiago. The cool new Apple headquarters looks like a silver donut... or flying saucer?